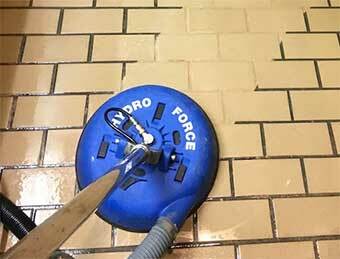 Tile cleaning is important in order to keep your facilities looking their best. Commercial tile floors see a lot of traffic. Even when mopped frequently, dirt, grime and grease accumulates in grout lines and uneven spots on tile. Maas Carpet Cleaning uses top of the line truck mounted equipment alongside a variety of tools to thoroughly clean tile and grout. See the difference our commercial tile cleaning services can make! Call 208-377-3403 for an Appointment with Owner Jim Maas. A professional tile cleaning job includes not just the main floor, but edges and corners as well. We use top of the line edge and wall tools to ensure the most thorough tile cleaning. We pressure wash your tile while simultaneously reclaiming the water with the vacuum from the truck. If you have been looking for a local commercial tile cleaning or grout cleaning company, you have found just the team. As Meridian tile cleaning experts, we can provide service across the greater Boise area. The Brush Pro machine has two heavy duty brushes that spin at 375 RPM to aggressively work grout lines without damaging the tiles. Proper tile cleaning requires plenty of heat, the right selection of detergents and solutions, agitation and high pressure rinsing. Fortunately, we have the right equipment to provide all that is needed and more to get amazing results. The tile cleaning results we get from are often nothing short of amazing. Frequently we hear things like “I never knew those grout lines were white, I always thought they were supposed to be black!”. Whether you are in a restaurant dealing with food spills, grease, and traffic in and out of a kitchen, or in an office bathroom or common area, if you haven’t professionally cleaned your tile and grout frequently, chances are you’re due to have the service completed. Tile washing is an important part of your overall commercial cleaning needs for your facility. Once your tile and grout cleaning ha been completed, it only makes sense to help it stay looking it’s best. We offer an optional tile sealing service as a follow up to cleaning your tile. We use some of the best penetrating tile sealers on the market (usually DuPont products) to make sure your tile is protected from stains and wear, keeping them looking better, longer. Tile sealing is a great final step to finish the job right. Our Boise cleaning business is locally owned and focused on professionalism and customer service since 1966. We use a powerful truck-mounted system to get your items washed. We are able to clean carpets, tile floors, and all upholstery in homes, boats, automobiles and motor homes. Celebrating 50 years of trust and honesty, we offer simple Flat Rate Pricing. We will never cut corners or recommend unnecessary cleaning services. We do business the old fashioned way– by telephone. Call Maas Carpet Cleaning today at 208-377-3403.